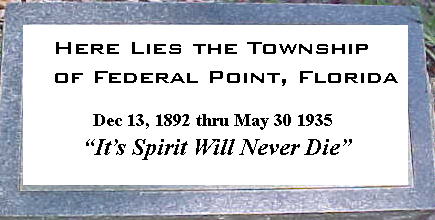 An ACT to Abolish the Town of Federal Point in Putnam County, State of Florida. Accounts and Property of the Town of Federal Point, Putnam County, Florida shall be turned over to the Board of County Commisioners of Putnam County, Florida, to be disposed of as said Board of County Commisioners shall determine is to the best interest of said abolished Town. Section 2. All laws or parts of laws in conflict herewith be and the same are hereby repealed. Section 3. This Act shall take effect immediately upon its becoming law. Became a law without the Governors approval. Please click the link above to learn the particulars of this grant. The first legal transfer of property at Federal Point was the Land Grant to Pedro Cocifacio and is listed on all documents here-to-forward as the "Cocifacio Grant". It was listed as being 2000 Acres while in actuality after survey in 1834 was found to be 2185.88 acres. There were several transfers of portions of this land prior to the purchase by John F. Tenney and John C. Folsom. How did the land know as The Cocifacio Grant become Federal Point as we know it today. We have taken a small parcel of the original 2000 acres and traced it up to todays owners. "I do hereby appoint Kingsley B. Gibbs, George Kingsley and Benjamin A. Putnam, as Guardians to my infant natural children, amongst whom I acknowledge all of those of Flora H. Kingsley of Camp New Hope, also Sara Murphy's mulatto child Micanopy now in Hayti. I do also solemnly enjoin my colored and natural children, that seeing the illiberal and inequitable laws of this Territory will not afford to them and to their children that protection and justice, which is due in civilized society to every human being ; Always to keep by them a Will, ready made and legally executed, directing the disposal of their property, after their death until they can remove themselves and properties to some land of liberty and equal rights, where the conditions of society are governed by some law less absurd than that of color. This I strongly recommend, nor do I know in what light the law may consider my acknowledged wife, Anna Madgigene. Jai, as our connubial relations took place in a foreign land, where our marriage was celebrated and solemnized by her native African custom although never celebrated according to the forms of Christian usage; yet she has always been respected as my wife and as such I acknowledge her, nor do I think that her truth, honor, integrity, moral conduct or good sense will lose in comparison with anyone." To escape the severe laws of the Territory of Florida relating to free people of color, about 1835 Kingsley established Anna Madgigene Jai and her children, together with some of his lesser wives and their children, in Hayti. He was on his way there to visit them when he died in New York. Following the end of the War for Southern Independence, Anna Madgigene Jai returned to Duval county where she continued to reside until she died some time prior to June 18, 1870, when her will was probated in the County Judge's court for Duval county. The principal beneficiary under her will was Martha Baxter, a daughter of Zephaniah and Anna, who had married a white man, as did also their daughter Mary Sammis. The latter predeceased her mother. Anna had filed a claim against the United States founded on the depredations following the uprising of the Patriots in 1813. It was curiously listed in the United States Senate report on these claims in the name of "Madgiqure, Ann, alias A. Kingsley." It was not allowed. From this point on the original 1000 acres are split numerous times. Kingsley Plantation today located on St. Georges Island in Jacksonville. The big event in many young lives was "an RC Cola and a Moon Pie" on a hot summer afternoon. It still stands today but is a private residence. Federal Point, a small community in northeast Florida on the east side of the St. Johns River, has an amazing and idyllic yesterday and today. Some things have changed in the past 130 years. However, some things are still very similar. When driving down Federal Point Road or Commercial Boulevard, you know that history is still in the making. The names of old pioneer families such as Tenney, Brown, Brubaker, DuPont and Atkinson are still visible on their descendants mailboxes today. Their roots are buried deep in the soil, and their hearts are entwined to form a community such as few people are able to experience today. The saying goes, Dont ever say anything bad about anyone in Federal Point, because were all related in some way and we like it that way. The first settler in the area was Cornelius DuPont. He lived right on the point, with his house overlooking the beautiful St. Johns River. He owned 1,500 acres and many slaves. DuPont was a wealthy man with a large amount of money on deposit in a bank in South Carolina. He rented his slaves to other landowners up and down the St. Johns. His house was large and comfortable, the only one on the point at the time, except for several small slave cabins. Life was pleasant and easy for him. The only road to Jacksonville was the St. Johns River. The road to St. Augustine was a trail, suitable for walking or horseback. When the trail crossed a creek or a branch, the early settlers forded the water and continued on their way. The early members of the community were cooperative in this wilderness. DuPont had only to hang a white flag on his dock, and soon somebody would answer the flag and inquire what was needed. Supplies from Jacksonville were often brought in this way. They relied heavily on the food hunted in the forest, taken from the river and grown in the garden. The woods and the river were alive with fish and game. The soil was rich and fertile, as evidenced by the fields of cabbage and potatoes. The Civil War seriously hampered the DuPonts lifestyle, as Yankee gunboats moved up and down the river, sometimes firing on homes and docks for no apparent reason. One day DuPont saw the Yankees landing at his dock. He knew the Federals were searching for Colonel Francis Dancy. Dancy lived with his family at Orange Mills and was home at that time, being too old for active military service. Cornelius DuPont mounted his horse and raced to the Dancy plantation to warn that enemy troops were approaching. The entire Dancy family fled the house and hid in the ditches in the fields while the Yankees searched the property. Even though the baby cried during the ordeal, the soldiers did not find anyone. After the troops left, Dancy moved further into the interior of the state and operated a supply line for the Confederate troops for the rest of the war. money on deposit in the bank was lost. His health was failing. He had no way to work his land. One day he hung a white flag on the dock and John Francis Tenney answered it. Tenney lived in a house in Orange Mills with his wife and children. In Tenneys book, Slavery, Secession and Success, he states that they brought supplies from Jacksonville for the DuPonts and then began to negotiate to purchase the land and house at what was then called DuPonts Landing. Records show that John Francis Tenney and Frank Folsom, his brother-in-law, bought the 1,000 acres that DuPont owned for $1,500. DuPont felt that the land was useless to him without slaves. In 1866, the Tenneys and the Folsoms moved to DuPonts Landing. They researched the records in the county seat, St. Augustine, and found that when the United States first acquired Florida, the surveyors wrote Federal Point for that area on their field notes. The name was changed at that time from Duponts Landing to Federal Point. Frank Folsom and John Tenney began to develop the land and build a community. Tombstones in the Federal Point Cemetery show that John Tenneys wife, Nancy, and their 8-year-old daughter and an infant daughter died within that year. The land was surveyed into lots of a few acres or more, and sold mostly to New Englanders who were anxious to find their spot in the sun. They came by sailing vessels and steamboats up the St. Johns River. They first ones lived in the slave quarters until they could build their houses. It was John Tenneys intention to populate Federal Point with honest and upright settlers. He accomplished his goal. Under his leadership, Federal Point became a thriving community. Orange groves covered the land as well as strawberries, potatoes and other vegetables. 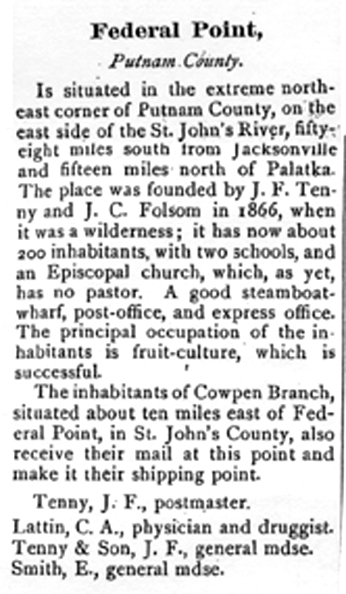 They found a lucrative market in Palatka and distant cities in sending their products on the St. Johns. A large wharf was built, jutting out from the point. Farmers from Federal Point and the Hastings area brought their fruit and vegetables by wagon, drove onto the wharf, and unloaded their wares onto the steamships that plied the St. Johns with passengers, mail and freight. It soon became known about the countryside that Tenney played a lively fiddle. His services were in demand at dances and parties as far away as St. Augustine. He records in his book the struggles he had fording the streams, and keeping his fiddle dry when he went throughout the countryside. As the community grew, John Tenney became known as Squire Tenney. He pushed for incorporation of Federal Point and became the mayor, a post that he held for more than 40 years. 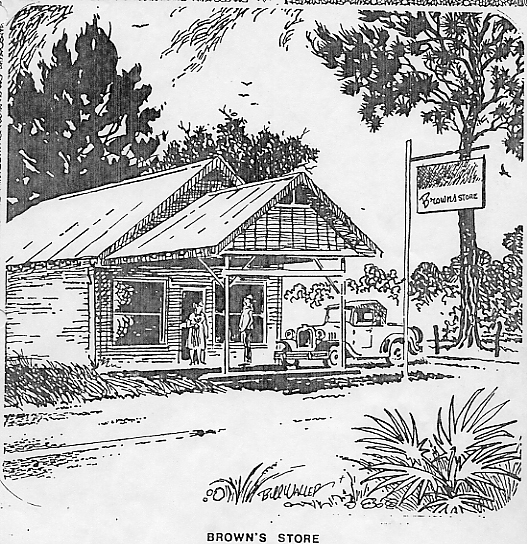 He operated a store, the post office and wharf, married again, played the fiddle, and wrote a weekly column for the Palatka newspaper. When his only son, Frank Folsom Tenney, grew up, he operated a hotel a few hundred feet from the wharf. The tourists came from the north to spend the entire winter there. They fished in the river, ate sumptuously in the dining room, walked in the orange groves and enjoyed the sunshine. Frank Tenney employed his family and neighbors in the business of running the Groveland Hotel. It was filled with beautiful antiques and contained cut glass in the dining room. The Groveland became the center of social life in Federal Point. Todays area senior citizens remember going there for special occasions such as a wedding reception. In addition to the activities at the hotel, a clubhouse was built across Commercial Avenue where the ladies met for their gatherings, teen-agers held their parties, and little children hunted for Easter eggs. It was Federal Points community center. In the early days, Captain Edwin Smith constructed a large building that was the forerunner of the Groveland Hotel. He opened a store and planted a 10-acre orange grove. His interest in the Episcopal Church prompted him to look into establishing a church in Federal Point. The first meetings were held in a large room in his house. St. Pauls Episcopal Church prompted him to look into establishing a church in Federal Point. The first meetings were held in a large room in his house. St. Pauls Episcopal Church stands today as a wonderful tribute to Captain Smith and the early pioneers who founded it in the 1880s. To worship in St. Pauls today is to experience a lively service, filled with the descendants of the early settlers. St. Pauls attendance is growing remarkably. An addition has been designed to preserve the historic look. Three of Squire Tenneys great-great-grand daughters help supply the music at the church. Today, the orange groves are all gone as victims of freezes. The big wharf is gone, probably a casualty of winds and tides. Steamships are no longer on the St. Johns so there is no need for the wharf. The clubhouse, post office and store are no longer there. Federal Point is not incorporated anymore so there is no need for a mayor. The hotel and Squire Tenneys house are still standing. Recently, Bob and Ginny Quackenbush purchased the property, and they have begun to restore the hotel. The people have preserved a sense of community in Federal Point. Whether an old timer or a newcomer, there is that feeling of belonging. Turn off Route 207, just a few miles east of Hastings to find the Federal Point Road. It is a scenic road through the countryside. The view from the road offers fields of potatoes, cabbage, flowers, glimpses of the river and of the stately homes that stand guard by the riverside. Some of the homes have been there since early days. March and April are azalea blooming time, a good time of the year to visit the cemetery off a little dirt road. Surrounding the cemetery are burgeoning azaleas. Huge oak trees stand like sentinels. In some places on the Federal Point Road an old brick road is still visible under the macadam. Many remember when it was a very narrow brick road connecting them to the outside world. The pavement went right over the brick, widened for todays cars. Browns Grocery, on the left side of the road, has been closed for years. The homes of the Atkinson sisters come into view. The story of the Browns and the Atkinsons make the history of Federal Point and the St. Johns River come alive. Lizzy Taylor Brown and Becky Taylor Atkinson were sisters, growing up just after the Civil War. Their parents were Ephram and Mary Charlotte Taylor. 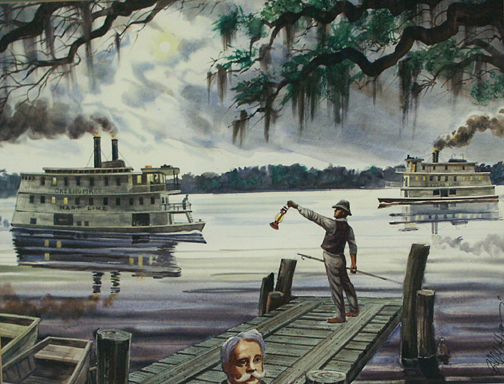 Ephram loved the St. Johns River, making his living selling fish. The fish sold readily up and down the river, but the life was very hard. Mary Charlotte, mother of the two girls, died and left Ephram to raise his children. He arranged for Lizzie to live with Squire Tenney and help to raise his young son, Frank. Becky lived with Ephram. He built a palmetto-thatched cabin on Tick Island, above Lake Monroe. Little 6-year-old Becky was left alone while Ephram fished the waters of the river. Becky was tied to a tree so that she could not get lost in the woods or drown in the river. Ephram had no other means to take care of his daughter. One day as he was returning home after fishing, he saw a huge alligator stalking Becky, who was asleep on the ground. He yelled and beat the water with the oars to scare the alligator away. The gator whirled and ran back to the river. But while turning, the gator hit Becky with its sharp, heavy tail and injured her. She carried the scars for the rest of her life. Not long after that happened Ephram found a water moccasin under Beckys bed. He then took Becky to live with Squire Tenney. Both girls grew up to Squires household. The descendants of Becky and Lizzie still live along Federal Point Road, on property purchased by the women and their husbands. At the end of Federal Point Road, turn left on Commercial Boulevard to head down to the river and the site of the old wharf. The road passes the Episcopal Church, pristine in its new coat of paint, new addition and new landscaping. Then the road passes the old Groveland Hotel, in the beginning stages of restoration. Squire Tenneys house still sits majestically on the riverfront in need of restoration. It doesnt take very long to tour Federal Point but the sounds from the past are almost audible; Squire Tenneys fiddle, steamships whistles, slave spirituals, Yankee gunboats, children playing by the river. Residents today don't live a pioneers life, but they still have the pioneer spirit. There is something unusual about the people at Federal Point. It is the unique place to be, yesterday and today! It was John Tenneys intention to populate Federal Point with honest and upright settlers. He accomplished his goal.